The two day mega ‘Global Leadership Forum’ kicked off its Day 1 with power packed sessions which saw senior global leaders discussing paradigms of leadership, along with the role of leaders in the current geopolitical and economic landscape. This forum seeks to bring together communities and countries for a sustainable world of the future. 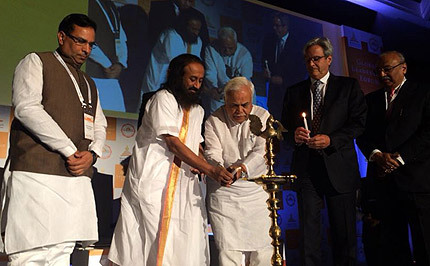 New Delhi under the aegis of the World Culture Festival, a celebration of The Art of Living’s 35 years of service to humanity, the first day of the forum saw prominent leaders such as Sri Sri Ravi Shankar- Spiritual leader and founder of the Art of Living, India, Hon. Mr. Nitin Gadkari,- Minister for Road Transport and Highways and Shipping, India, H.E. Mr. Kamal Thapa, Deputy Prime Minister, Nepal, Ms. Sherry Rehman, Member of Senate and Vice President of People’s Party, Pakistan, H.E. Mr. Dominique de Villepin, Former Prime Minister, France, Ms. Arundhati Bhattacharya- Chairperson, State Bank of India, India, Mr. Michael S. Perlis- President and CEO of Forbes Media LLC, United States of America, Mr. Kishore Biyani- Chairman, Group CEO, Future Group, India, Mr. Anurag Batra- Chairman GBN Media, BW, Business World, Exchange4media Group, India, Hon. Mr. Matthew Offord- Member of Parliament, United Kingdom, Mr. Shashikant Sharma- Comptroller and Auditor General, India, Mr. Samarth Bedi- Executive Director, Forest Essentials, to name a few. Inaugurating the august forum, Sri Sri Ravi Shankar, Global Humanitarian and Founder, Art of Living, said “A leader always walks the last, and makes everyone move ahead. A leader is not meant to create followers, but rather create leaders. This is the concept of Bodhi Sattva – which originated in India and Nepal. A leader will always seek challenges. Youthfulness to me means challenges. A young leader will be ready to take any challenge which the world gives you. It keep you on your toes, this is what awakens your youthful energy. It inspires you to come up with more enthusiasm and energy beyond your normal capacity. So you all come together and think on global leadership. Thinking, discussing, arguing and disagreeing will all lead to something very good –if done with the right intention and purpose for the right cause”. Day 2 of the mega forum will include prominent speakers including Hon. Mr. Suresh Prabhu, Railway Minister, India, Hon. Mr. Piyush Goyal, Minister of State with Independent Charge for Power, New and Renewable Energy, India, Hon. General Vijay Kumar Singh, Minister of State for External Affairs, Minister of State for Statistics and Program Implementation, India, Dr. Arvind Panagariya, Vice Chairman of Niti Aaayog , India, Dr. Kiran Bedi, Receipt on Ramon Magsaysay Award, IPS Officer 1972-2007, Hon. Ms. Meenakshi Lekhi, Member of Parliament, India among others. Founded by Sri Sri Ravi Shankar, Art of Living is celebrating completion of 35 successful years of service to humanity in the form of World Cultural Festival. Going with the motto of a world as ‘Vasudhaiva Kuttumbakam’ which means ‘one family’ and making Life a Celebration, the forum seeks to bring accomplished leaders from the world to discuss not only the challenges they faced but also share their journeys and successes. The opportunities to reflect on learning from them will help bring about a peaceful world of tomorrow. The forum saw deep discussions including the role of governments in managing natural and human resources and also relations with countries and organizations world-wide; the role of digital and economic progression in creating the reality of ‘Boundaryless nations’; examining the need to pursue a farsighted approach to tracking business trends amongst others.